Sometimes when you start down the path of intensively analyzing a Sasquatch/Bigfoot cast, the examination can open a can of worms. Opening a can of worms is an English language idiom meaning there is a troublesome situation, involving an issue whose resolution is contentious, often simple, and sometimes with surprise consequences. How could we expect anything less when involved in Bigfootery? 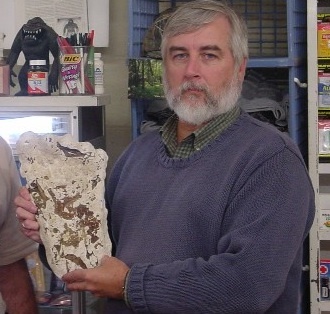 In the first installment of this series, “When Southern Bigfoot Casts Are Really Western,” a cast displayed in Fouke, Arkansas, which confusingly appeared in a reality television program as if it was from a track of a Boggy Creek creature, was discussed. The Monster Mart, Fouke, Arkansas cast. Here I am in 2002 holding this enigmatic cast. 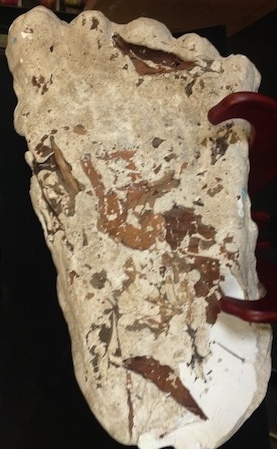 As I mentioned in the earlier essay, in 2012, I took photographs of this cast and its label denoting its origin. The cast was copied from one taken of 300 found in the “High Cascades” in December 1990. Please note, 300. Dated December 1990. 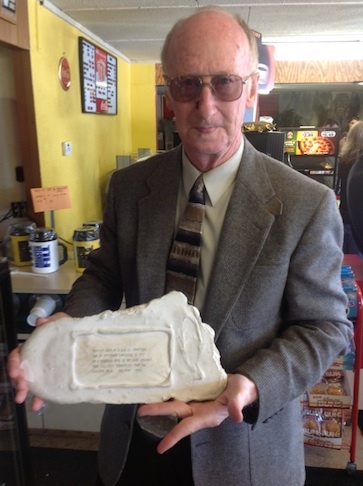 “The wooden plaque on the back of the cast replica made by Larry Lund. 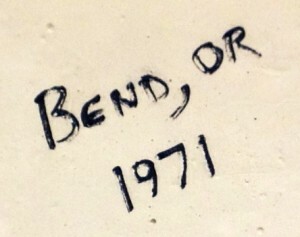 Lund has the latex mold of the original, so copies from him are first generation,” noted Cliff Barackman. This cast has been widely disseminated, not directly by Peter Byrne, but via his friend, Larry Lund. 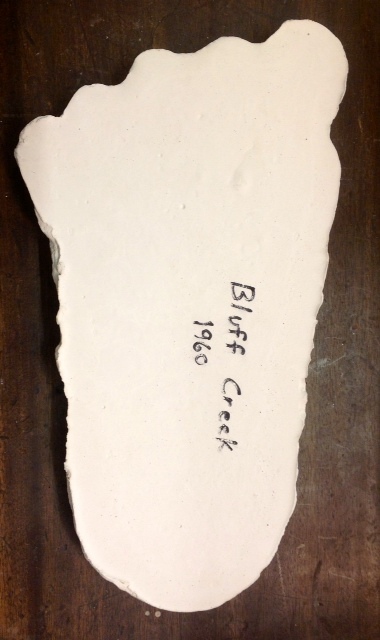 Byrne has been able to supply little information, but at one time said this was “Bluff Creek 1960,” as noted on the cast copy I and others have obtained via Ray Crowe/Larry Lund. This cast was made in 1960 by Peter Byrne. He told me at his home that he had only found two nice prints over the years, and cast one of them (one was in several inches of water). 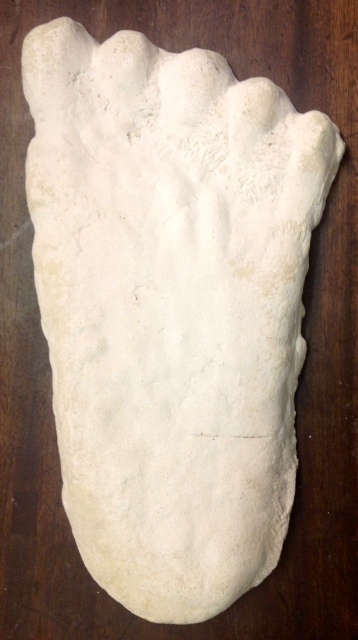 He then showed me a photograph of the footprint and informed me that the latex mold of the cast had been given to Larry Lund of Vancouver, WA as a gift. I later obtained a copy of the cast from Lund. 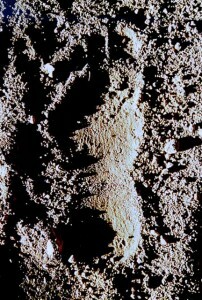 Based on the shape of the footprint in the ground, it is clear from the photographs that the latex mold given to Lund is not from the print that Byrne photographed in 1960. I inquired to Lund about the discrepancy, and he was kind enough to ask Byrne about the issue. He seemed as puzzled as we were. Source. 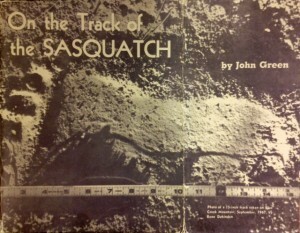 Cliff’s caption: A beautiful photograph of the footprint in the ground. Clearly, the shape does not match that of the cast. 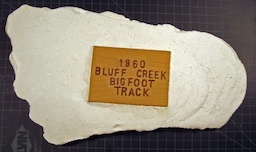 Obviously the track photograph does not match the alleged 1960 Bluff Creek cast. Barackman was not able to discover what happened to the cast of the 1960 print that was supposedly taken, as well as the real source of the print that Larry Lund was distributing, from either Byrne or Lund. 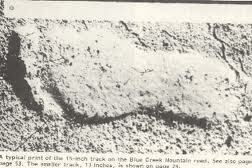 “The only track photo I know of [Peter Byrne's] using looks exactly like one of our 1967 Blue Creek Mountain track photos, nature of ground, extreme angle of the shadows, etc. but it is not one that I have now. Over the years, one way or another I have lost most of mine, including even the one I used on the cover for the first printings of my first book. Of course there were probably other people besides Rene [Dahinden] and I who photographed those tracks, but not Byrne, who was in Nepal. In various publications he has claimed in detail that it is from more than one place, more than one year, more than one size and both color and black and white.” – John Green, May 19, 2013. Indeed, the deeper you look into the Bigfoot track/cast database about this image, the more muddled the picture gets. Colored photos of it are there, in gray and in red. 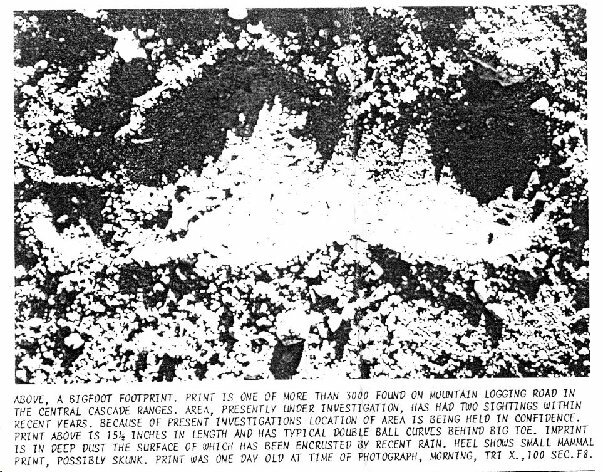 Pictures in black and white describe this footprint as one of 3000 (yes, three thousand, not three hundred) found in the Central Cascade Ranges in 1975, not 1960. Some have been flipped, but the shadows match, as do the substrata. 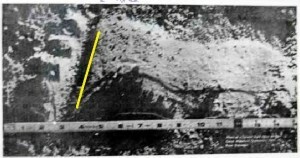 John Green brings up another date for the source of this photograph, 1967, from Blue Creek Mountain, which is technically a creek and mountain over from Bluff Creek. Green’s and Rene Dahinden’s photographs from the 1967 trackway do show sharp shadows and extremely similar individual footprints to the one that Byrne has variously linked to both 1960 and 1975. Therefore, out of a simple investigative look at a single cast in Arkansas, we have been lead here, to questions about that cast, to unanswered inquiries about that cast’s origins, and to greater reservations about the alleged photograph of a track that was said to go with the cast. The database is damaged. The evidence is not pure. Repairs and resolutions are long overdue. Soon, I will examine a group of replicas and prints that cluster in the database. They have resulted in doubts about a large group of casts. In Part Six, some proposed systematic approaches to the cast database and changes are put on the table. This statement is applicable throughout the entire site. This is a great series of articles, Loren. I’m looking forward to the rest. Any chance that this will end up in a book? This is some excellent work, Loren….the whole series.